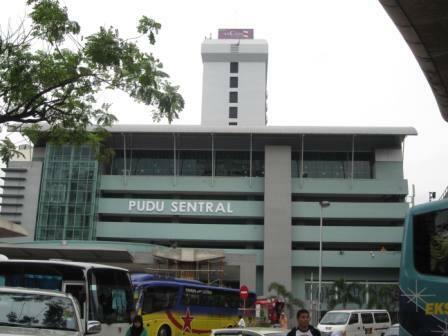 Puduraya or now known as Pudu Sentral is one of the major bus hub selling bus tickets to northern part (Penang, Ipoh, Perak, Kedah and Hatyai) as well as some buses to Kuantan. It is back in operation for about a year since its last renovation where the bus operations were temporary shifted to Bukit Jalil. Now, it is back to Puduraya again. 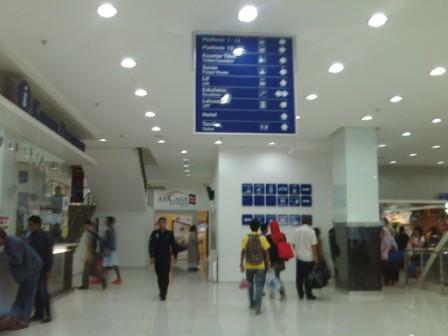 In the midde area, there is a police booth and an information counter (kaunter pertanyaan). There are clear signboards. 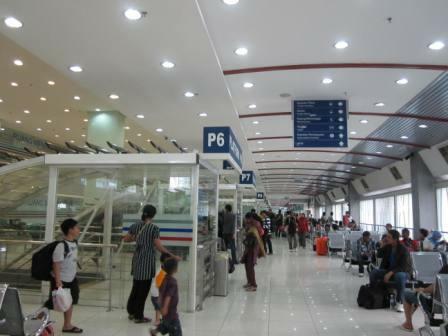 Above: The waiting area is bright, air conditioned and clean. The white glass structure you see on your left is actually a closed glass door that only opens if you press on a button. 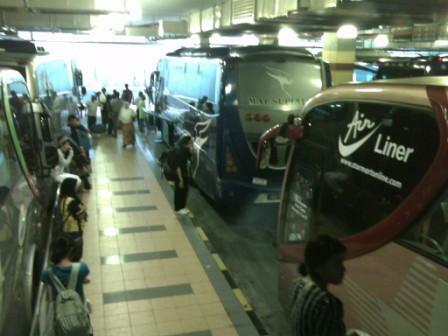 Below is the bus waiting area- and in the past, the non air conditioned place used to be stuffy and smokey as the smoke from the waiting buses travelled up. It is not so crowded as last time as buses to Southern and East Coast have been diverted to other hubs (Titiwangsa and Cheras). 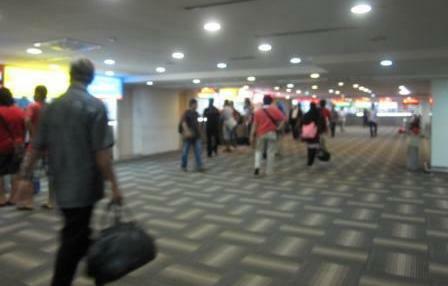 Now, the air is clean and the bright and clean place makes the waiting less agitating. Also because of the air con, the noise from the endless traffic is diverted. Another addition I find particularly helpful is the LCD boards where the bus departure are listed by lanes and time. And whether the buses are canceled or not is even informed to us. The place is almost like an airport waiting area. 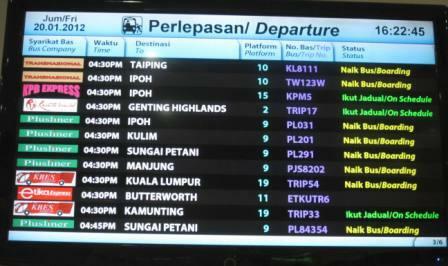 There are many of such electronic boards at the waiting area, ticketing area and even in the food court located at level 4 (we don’t want people to miss their busses while having their meals, do we). 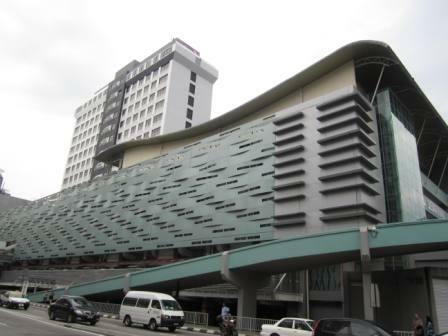 STAR train by stopping at Plaza Rakyat station- there is some internal walkway to get to Puduraya from Plaza Rakyat train station which would shield you from the weather conditions. 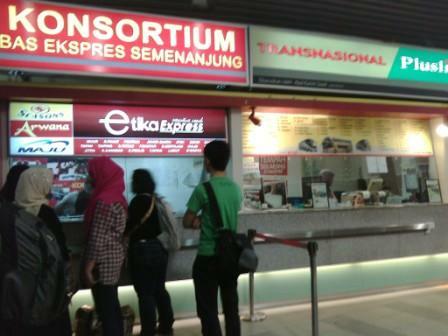 If you stop at Plaza Rakyat station, you can also get your bus tickets from there from Konsortium and Transnational/ Plusliner. In the past when I travel interstate, I preferred these busses because they usually leave on time and their ticketing system is computerised.